The largest distribution centre in the Southern Hemisphere, Sydney Markets Limited, has received the ‘Best Renewable Resources: Recycling' award at the Global Sustainability Leadership Conference and Awards at the World Corporate Social Responsibility (CSR) Congress held in Mumbai, India. Sydney Markets won from over 2,500 international entries received for the award. 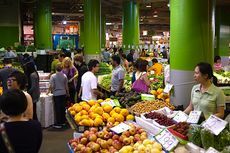 It recognised Sydney Markets for its innovation and commitment to sustainable business practices, closing the loop and reducing its environmental footprint through waste management, recycling, water and energy savings. An onsite Green Point Facility that operates daily to allow tenants to deliver waste to be sorted, separated and diverted into eight waste streams including organic, cardboard/paper, timber, steel, plastic, polystyrene, steel and concrete. Working with Veolia Environmental Services to collect and transport waste streams with the aim of diverting majority of the organic waste produced. Over 4,000 tonnes of organic waste is processed each year by EarthPower Technologies using anaerobic digestion technology to convert solid and liquid wastes using bacteria into a biogas and a sludge that is dried to produce a high nutrient organic fertiliser. The onsite recycling of polystyrene using a machine at Sydney Markets Flemington that has resulted in over 50 tonnes per annum of polystyrene or the equivalent of over 200,000 boxes being recycled. The daily collection and recycling of plastic film in excess of 30 tonnes per annum. The reusing and recycling of timber pallets with damaged pallets being shredded and turned into garden mulch. About 1,156 tonnes of timber pallets were recycled in 2013. Reducing paper consumption by 30 percent since 2011 with the introduction of electronic invoicing to tenants, sending information by email and staff education. Working with Planet Ark to recycle over 120 kilograms of printer cartridges and old mobile phones in 2013. Other initiatives have been put in place to collect fluorescent tubes, light bulbs, batteries and other e-waste. Water recycling plans will be incorporated in Sydney Markets' environmental management plans in the near future.